Many new 8-dans have recently appeared on KGS to the delight of the Go community there, but of course that what people really want to see is a battle between two 9-dans. Today that wish was granted. Until this day, DaoCe's strongest opponents had all been 8-dan; that changed now that he finally took the challenge of another 9-dan player: 'maynerd'. The game was very exciting: it started with a complicated joseki (that involves a ladder), which was followed by two big ko fights in the corners. 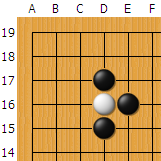 The result was that while Black got the corners, White gained a lot of influence over the center. 'DaoCe' made use of that influence in the subsequent fights and eventually came out ahead. It was one of those complicated games where the kibitzers (us) only know who is leading when the game is over... 'maynerd' resigned at move 272 (he was behind by 10 points). So this game was DaoCe's first victory against a 9-dan. It reached 700 observers. Astounding! This was an amazing game, indeed. Im happy that i had the chance to watch it live. Exciting game! Thx for showing!